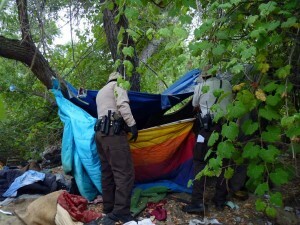 Plans call for much of the project to be funded by way of homelessness-related grant money passed down from the state of California to San Luis Obispo County. The agencies involved in the project are applying for those funds, as well as some federal grant money. The project would help get homeless people out of the Salinas Riverbed, where storms have led to dangerous situations. As currently planned, the shelter would initially be open overnight in the months of November through March. I travel for work and have offered free training to homeless. Equipment operator jobs Out of approximately 30 men and 5 women, only 5 went on to full-time employment and better living conditions. Having been homeless temporarily in Alaska when I was 25 due to a lack of housing, I am very aware of the problems of shelters. The homeless with mental issues are both paranoid and afraid. In most shelter’s, they pack them in like sardines. Lots of people with lots of problems crammed together is a TERRIBLE idea. What works; small rooms with security and locks. Accommodations are for 60 days. Not in 1 day, out the next. That way they are stable, and can find both job and housing, possibly health issues too. Trained, social dogs are allowed. Muzzles for those that bite. Most homeless would sleep on the street on a 30° night than give up their dog. And NO religion. That drives off 90% of the homeless. Having someone both judge them AND tell them how THEIR God can save their lives is such a demoralizing act. That is NOT Charity. Especially if they’re of a different faith. This is what works. I’ve spoken to over 100 homeless people, and at least 30 who have transitioned out of the streets into a home and good job. I was also homeless. Sure, I got lucky. But we, as a society can make some of that luck a reality. And NO religion. That drives off 90% of the homeless. Having someone both judge them AND tell them how THEIR God can save their lives is such a demoralizing act. That is NOT Charity. Especially if they’re of a different faith. Being that their current worldview got them into this mess, I would think that a realignment of personal beliefs is not a bad idea at all. Why not twenty man tents with canvas cots? If it is good enough for the military it is good enough for people that don’t want to work . They could eat surplus army rationas . Also portable showers. While the 36 bed facility will likely do some good for some people, the tweak era in the creek aren’t going anywhere they have to abide by any rules. The facility will be built but nothing will change in the creek bed. That is your first mistake right there. Once someone thinks they are owed something by the government, what type of non-government initiative do you think they are going to do? BTW, I don’t think they are uneducated deadbeats. I think they do know how to play the system OR have mental issues. It is not an easily described condition. Why work when you can say I’m homeless then get medical,food a place to sleep then beg for money to buy your drugs and alcohol. My daughter works for a large grocery and she said the bums even open a box take out the bottle drink the vanilla put the bottle back in the box and back onto the shelf. I guess they havent heard of snorting nutmeg and allspice. $1.7 million for a new homeless/transient center but $13.7 million for a new SLO Couty animal shelter. Why such a difference in cost? This is a good compassionate decision as no one should ever have to freeze or go hungry in America irregardless of their condition in life. Obviously this is not the answer to the problem but at least someone is trying. My only objection to this is that in Atascadero their is ECHO that has received financial support from the city and is by far the best example in the county, state or nation of what can be done when the government is not in control of the funds. I will have to say that I see no justification with Atascadero using any taxpayer funds, yes grants are taxpayer’s funds, to use in Paso Robles. Paso Robles has a much more robust economy than Atascadero and should be solely responsible for their own project. If grant money is provided to Atascadero it should be spent in Atascadero and directed towards ECHO. Years ago Atascadero “loaned” hundreds of thousands of dollars to Paso Robles with PG&E credits (no cash was involved) with no strings attached or any repayment schedule. The citizens of Atascadero need to keep their funds and spend them in Atascadero. Turn the old boys school Paso by airport in into a mental health facility …The homeless should be arrested for being a danger to themselves and others taken to the boys school for 72 hour evaluation .. Then kept at facility to dry out withdraw from drugs and booze and only released when going competent to exist in society .There should be counciling and pre release program to arrange for housing and possible job training and health care and hygiene taught and enforced .Ronald Reagan closed alot of California mental health facilities now the public is the mental health facility .. Codgering is not the answer tough love and coinciding in a controlled program with military regiment to to teach and create normal human traits is what is needed . Arrest people without committing a crime? Are we in Nazi Germany and have no rights? Military regiment? What percent of the homeless are former military? Nationwide, I would guess probably about a third. What about those of us who had careers and are now homeless? Mine was a critical safety occupation (Airline mechanic). Tens of thousands of us were laid off. I also have a heart condition that got worse and I can’t work anymore. Plus severe arthritis, DDD, and Diabetes . I also have PTSD and Major Depression Disorder after a family tragedy (murder/suicide). I’m not a drug addict or a drunk. I’m not a thief. I have a clean record and perfect driving record. And like many other homeless people like myself, you would never no know it. I have an older but nice car, clean clothes and I’m clean cut. With living on disability (SSI) at $900 per month, please tell where I can afford to live? So I would appreciate it if you don’t stereotype “homeless people”. You certainly have been exposed by bums, druggies and drunks. Those are the vocal and obvious minority. But trust me, the majority of homeless are just normal people who simply can’t afford housing. And the shelters are useless in my experience. CAPSLO is corrupt as hell and refuses to help anyone find a place to live. I’m afraid you don’t have any idea of the “big picture” of being homeless. I hope you never find out what it’s like. And people say this is a “Christian country”. Yah right. You said homeless people “bring their disability check to Casino…”. That’s just plain bull. The Social Security Administration stopped issuing checks years ago. So you said you were homeless several times; were you arrested for your own good? So were you a drug addict/alcoholic? Did you go through a “military regiment? Did you steal a lot of bicycles? Sorry, but your story just doesn’t seem to add up. I agree totally. There have been a lot of places I would have loved to live, own a house, or even rent but could not afford to do so. It makes no sense to live in a County or State that you just can’t afford. It is heartbreaking to see children among the homeless. You have been reading my playbook, I’ve been saying the same type of thing here in San Luis about the backside of Cuesta Collage, pick them up and fix them,if possible. And as far as rights what about our rights, these bums use downtown sidewalks as a bathroom, well so do drunk Poly kids, they accost people on the street, they steal when noone is looking,we have right also. When are where have your rights been violated? As far as students goes, if the slumlords keeping rich from the students, then you’re going to expect student behavior. If Cal Poly disappears, San Luis Obispo would simply vanish.